ESA’s Venus Express spacecraft has discovered an ozone layer high in the atmosphere of Venus. Comparing its properties with those of the equivalent layers on Earth and Mars will help astronomers refine their searches for life on other planets. The results were presented at the Joint Meeting of the European Planetary Science Congress and the American Astronomical Society’s Division for Planetary Sciences. Venus Express made the discovery while watching stars seen right at the edge of the planet set through its atmosphere. Its SPICAV instrument analyzed the starlight, looking for the characteristic fingerprints of gases in the atmosphere as they absorbed light at specific wavelengths. The ozone was detectable because it absorbed some of the ultraviolet from the starlight. Ozone is a molecule containing three oxygen atoms. 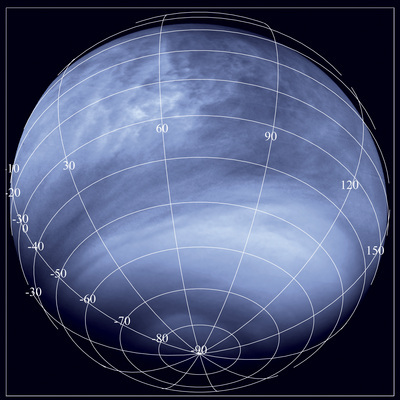 According to computer models, the ozone on Venus is formed when sunlight breaks up carbon dioxide molecules, releasing oxygen atoms. 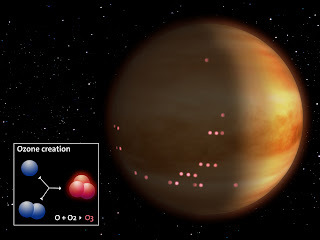 These atoms are then swept around to the night side of the planet by winds in the atmosphere: they can then combine to form two-atom oxygen molecules, but also sometimes three-atom ozone molecules. “This detection gives us an important constraint on understanding the chemistry of Venus’s atmosphere,” says Franck Montmessin, who led the research. It may also offer a useful comparison for searching for life on other worlds. Ozone has only previously been detected in the atmospheres of Earth and Mars. On Earth, it is of fundamental importance to life because it absorbs much of the Sun’s harmful ultraviolet rays. Not only that, it is thought to have been generated by life itself in the first place. The build-up of oxygen, and consequently ozone, in Earth’s atmosphere began 2.4 billion years ago. Although the exact reasons for it are not entirely understood, microbes excreting oxygen as a waste gas must have played an important role. Along with plant life, they continue to do so, constantly replenishing Earth’s oxygen and ozone. As a result, some astrobiologists have suggested that the simultaneous presence of carbon dioxide, oxygen and ozone in an atmosphere could be used to tell whether there could be life on the planet. This would allow future telescopes to target planets around other stars and assess their habitability. However, as these new results highlight, the amount of ozone is crucial. The small amount of ozone in Mars’s atmosphere has not been generated by life. There, it is the result of sunlight breaking up carbon dioxide molecules. Venus too, now supports this view of a modest ozone build-up by non-biological means. Its ozone layer sits at an altitude of 100 km, about four times higher in the atmosphere than Earth’s and is a hundred to a thousand times less dense. Theoretical work by astrobiologists suggests that a planet’s ozone concentration must be 20% of Earth’s value before life should be considered as a cause. “This ozone detection tells us a lot about the circulation and the chemistry of Venus’s atmosphere,” says Håkan Svedhem, ESA Project Scientist for the Venus Express mission.